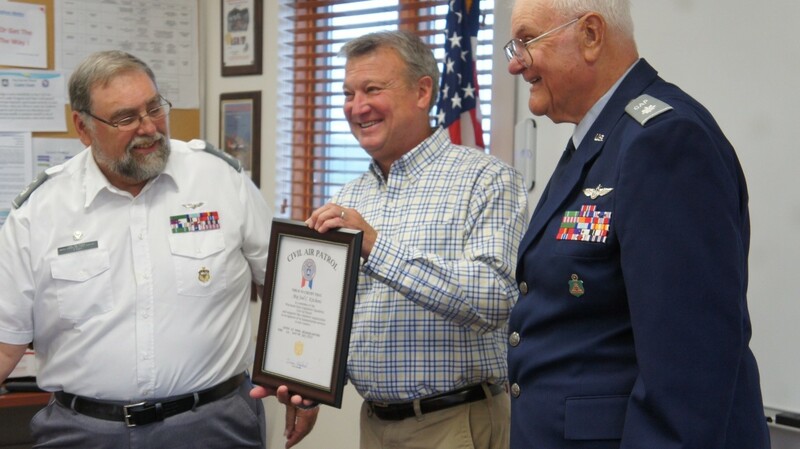 Wisconsin State Representative (1st Assembly District), Joel Kitchens, was presented with a Legislative Membership in the Civil Air Patrol on Saturday, July 21st. The Door County Composite Squadron of the Civil Air Patrol hosted the event at the Door County Cherryland Airport in Sturgeon Bay, WI. Squadron Commander, Lt Col. David Fish, and Deputy Commander, Lt Col Ronald R. Marto presented Representative Kitchens with a framed Certificate of Legislative Membership, the rank of Major, a Civil Air Patrol polo, a Wisconsin Civil Air Patrol challenge coin, and the Sturgeon Bay Composite Squadrons “wooden nickel” challenge coin. Representative Kitchens was also on hand to congratulate several Cadets on achieving their Wright Brothers Milestone Award and presented them with their achievement ribbons.